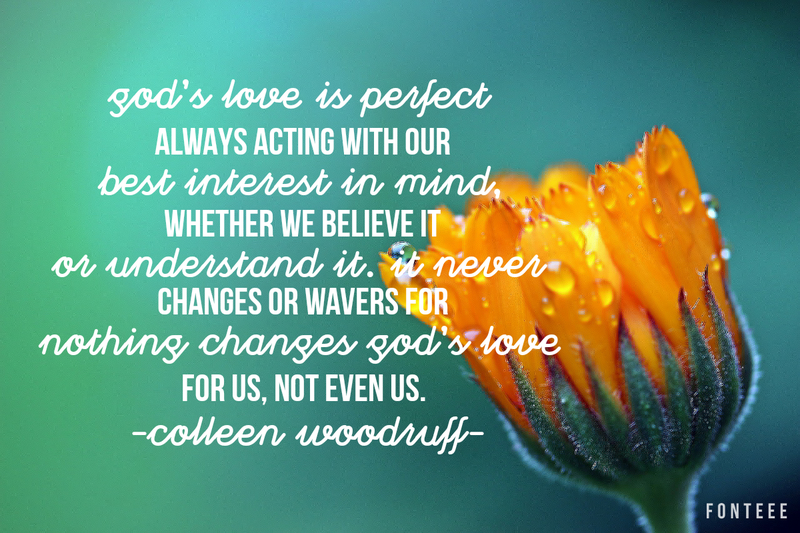 “But God demonstrated His love toward us, in that while we were yet sinners, Christ died for us” Romans 5:8. “For Christ also died for sins once for all, the just for the unjust, so that He might bring us to God, having been put to death in the flesh, but made alive in the spirit;” I Peter 3:18. “Yet He has now reconciled you in His fleshly body through death, in order to present you before Him holy and blameless and beyond reproach” Colossians 1:22. “For to this end Christ died and lived again, that He might be Lord both of the dead and of the living” Romans 14:9. “We know love by this, that He laid down His life for us; and we ought to lay down our lives for the brethren” I John 3:16. “Knowing that you were not redeemed with perishable things like silver or gold from your futile way of life inherited from your forefathers, but with precious blood, as of a lamb unblemished and spotless, the blood of Christ” I Peter 1:18-19. “He who was delivered over because of our transgressions, and was raised because of our justification” Romans 4:25. “I am the good Shepherd; the good Shepherd lays down His life for the sheep. Even the Father knows me and I know the Father; and I lay down My life for the sheep” John 10:11,15. “For while we were still helpless, at the right time Christ died for the ungodly. For if while we were enemies we were reconciled to God through the death of His Son, much more, having been reconciled, we shall be saved by His life” Romans 5:6,10. “For the love of Christ controls us, having concluded this, that one died for all, therefore all died; and He died for all, so that they who live might no longer live for themselves, but for Him who died and rose again in their behalf” 2 Corinthians 5:14-15. “Who died for us, so that whether we are awake or asleep, we will live together with Him” I Thessalonians 5:10. In these 16 verses alone they just my the goosebumps! Seeing the love of the Father and the Son for mankind…for me, for you…I am overwhelmed. I am humbled yet incredibly encouraged that He loves me so. He loves you that much!!! There are numberous passages beyond these that we could quote, yet in these 16 verses alone we see clearly see who God is, His physical acts of love upon mankind along with His love for mankind. His Son’s love, display, physical death and resurrection, submission to the will of the Father, beyond discription of outward and inward love for both us and his Father. What a display of example to us. Together, we could literally spend hours filling pages full of God, His attributes or character. We could fill blog posts of the Words of God proclaiming how Scripture is compacted with living displays of vibrant, consistent, unchangeable, unwavering, unshakable, demonstrations of God’s love for mankind from time past, this present day, and in the future to come showing our immense need for thee Savior. Sadly, in the midst of all this knowledge (yes, I am talking to believers here), we often fail to live in the land of belief, trust, and simply put “not quiet sure God’s got this” mindset that lives out ‘self is better than God’. Oh, we would never say this outwardly but we live, make decisions, act, think, and like it. You may disagree with me, but this leans me to one thought. One question. Take some time to evaluate and take inventory of yourself–what do you do or don’t do, how do you live or not live your saved-by-grace-heaven-God-given-bound earthly life here on Earth, what comes out of your mouth or not, what is it you choose to dwell on or not dwell on, how you spend your time, look in your check book, how much do you love God and display that love to Him. Now honesty answer this question: WHO is sitting on the throne of your life? Two cannot reign at the same time. It is either YOU or GOD. So, how is it? WHO is in control? The duct tape or the nails? We read, hear sermons, maybe even teach a class, sing in choir or lead the choir, yet still doubt the God in whom took the nails for us. We doubt that God can’t and I am better able. We choose the duct tape. We deny the power of those nails and choose our handy-dandy self-duct tape to fix our life’s problems when all we need, who we need, is given to us within the pages of Truth, God’s Word. Sure, real duct tape has its purpose in real life; we would never think of using duct tape to build a house. 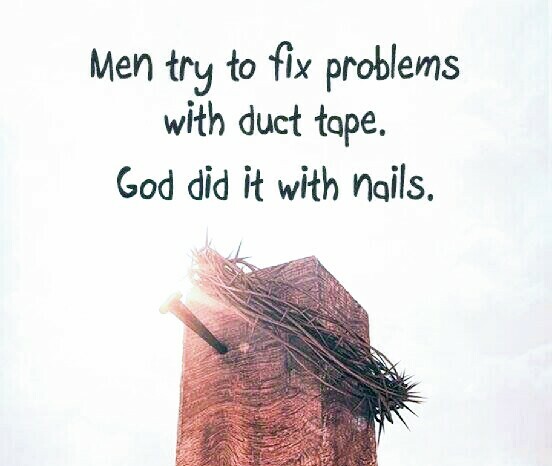 Thus we should never metaphorically replace Christ’s nails with our own self-induced duct tape and count it stronger or more reliable than Christ’s nails…NEVER! How are you building sister or brother in Christ?